Students at the Redemptorist Vocational School for People with Disabilities recently had a week off from study as a large majority of students traveled across country to participate in the National Games for the Disabled. 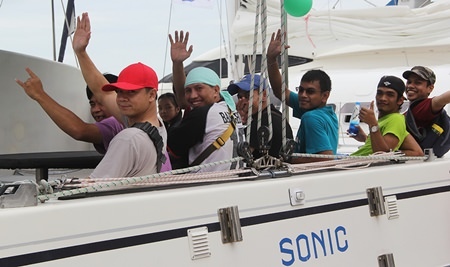 Those not selected to travel to the province of Nakhon Sawan, where the Games were taking place, were treated to an afternoon of sailing around the islands off the coast of Pattaya, thanks to the Disabled Sailing Association of Thailand. Excited to be climbing on board a boat for the very first time. It was thought that the torrential rains on the morning of the 16th January would mean a postponement, but a few drops of water was not going to spoil anyone’s excitement. Several vehicles, packed full of students and their wheelchairs, arrived at Ocean Marina in Na Jomtien where they were met by Peter Jacobs, from the Disabled Sailing Association Thailand, and his team of dedicated boat owners and sailors. Help was available to anyone who required it and many needed assistance getting down the ramps and on board safely. 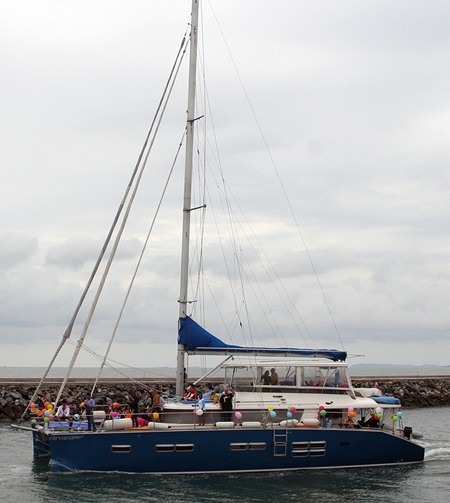 A flotilla of boats, including three large catamarans, left the marina and spent several hours at sea, a new experience for almost every single student and teacher on board. Dodging the rain clouds the boats made their way south towards Koh Ped, known to most by its more famous name, Monkey Island, where the students were met by several hundred of the island’s inhabitants. 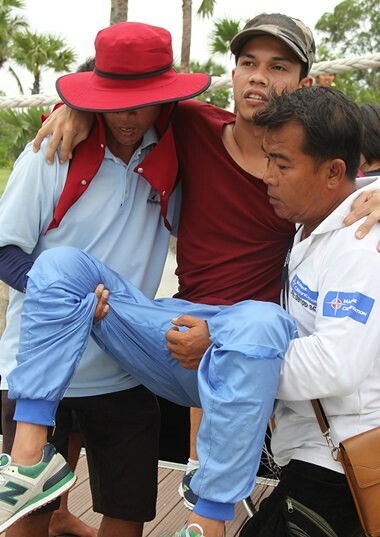 It was a well-earned rest for Narong, assistant director at the school. Apart from giving the students a new experience, it is also hoped that a few hours at sea will inspire them to take up the sport of sailing. The school has a long tradition of providing sports facilities to its students. Many have gone on to represent Thailand at international sporting competitions, including the Paralympic Games. It was good to get away from the classroom, even for just a few hours. 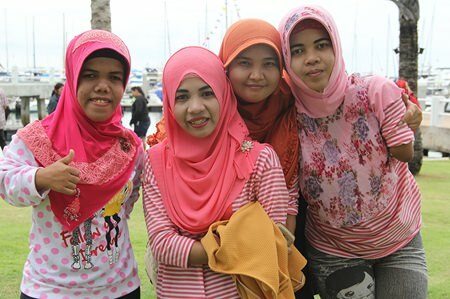 However, unlike Singapore, Malaysia, the Philippines, and Indonesia, Thailand has yet to enter a team in any international sailing competition open to people with disabilities. 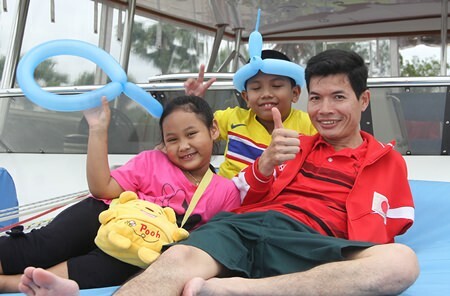 It is hoped that their first experience at sea will not be their last, and in the not too distant future a student from Pattaya will be sailing at the SE Asian Games or the Asian Games; or even better, the 2020 Paralympic Games in Tokyo. No one was too heavy to be lifted on board. Sitting comfortably and ready to set sail. Thanks to everyone who was there to help the students. 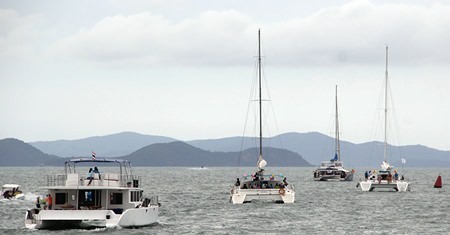 The flotilla heads towards Monkey Island. The Nirvana at the head of the flotilla.